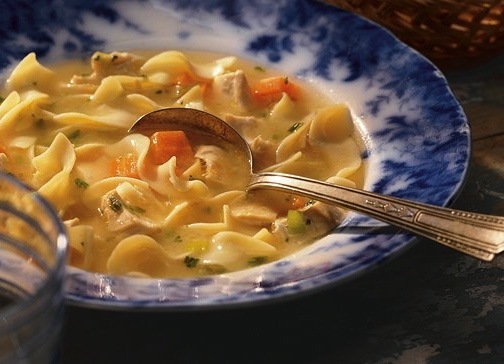 I adore homemade chicken noodle soup, especially with grilled chicken and lemon juice! It elevates this classic recipe in a way that is subtle, yet undeniable. However, if I make chicken noodle soup for you, it most likely means that you are either feeling under the weather or things are not going well in your world. I’ve been told that I am a feeder (and I suppose it’s true). I believe that food feeds the soul as much as it feeds the body. If I am worried about you, chances are I may show up at your door with a pot of chicken noodle soup. The action and ritual of making soup keeps both my hands and brain busy. That said, I am a talker too! So, if you’re well enough, you can sit at my kitchen table and keep me company while I cook. Either way we will all be happy and well feed. As M. F. K. Fisher once said, “Sharing food with another human being is an intimate act that should not be indulged in lightly.” Enjoy. 1. Heat the oil in a large stock pot over medium heat. Add onion and garlic sauteeing for 5 minutes. Then add carrots, celery, onion, thyme, 1½ teaspoons salt, and ½ teaspoon pepper. Cook, stirring frequently, until the vegetables are tender and just beginning to brown, 10 to 12 minutes. 2. Add the chicken and broth, bring to a light boil. Reduce heat, add pasta and simmer until al dente, 8 to 10 minutes. Add lemon juice and parsley; stir to combine.